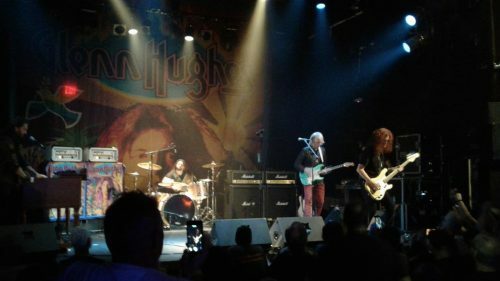 Glenn Hughes brought his incredible lung power and bass playing finesse to a small but very appreciative crowd at The Chance in downtown Poughkeepsie, New York last Tuesday September 11th, 2018. Glenn opened the show with Stormbringer and then settled into a really groovy Might Just Take Your Life. Next up was Sail Away, followed by a great version of You Fool No One with a cameo shot of the Highball Shooter riff teased in near the end of the song. A beautiful rendition of You Keep on Moving was followed by a really funky Getting Tighter (with a little Dance to the Rock & Roll sprinkled in) which Glenn dedicated to Tommy Bolin. Next up was Mistreated – one of the finest versions I have seen and heard Glenn perform – really nice tasty interplay between he on bass and guitarist Jeff Kolman; and of course Glenn’s amazing, stratospheric vocals as usual. As this was a Deep Purple-flavoured show, albeit mostly Mark III; Glenn closed with Smoke on the Water and added his own twist to it – “Georgia…”. For the first encore one of the roadies strapped on Glenn’s bass while Glenn came out to do the vocal duties on Highway Star. Even though HS is an Ian Gillan signature song, Glenn did fine justice to it with his amazing vocal range. The final song of the evening was a blazing version of Burn. Altogether about an hour and 45 minute show of very high energy, extremely well performed classic Deep Purple Mark III music. I have seen both the current Deep Purple line-up and Ritchie Blackmore’s Rainbow in concert this past year, and though both shows were very nicely done and well played; I have to say that Glenn Hughes’ Purple show was the rawest, most energetic, and most passionate of the three. Looking forward to catching Glenn again on his next swing through the USA in the upcoming year. It is well worth making a special trip to see him play. Posted by The Spanish Archer on Tuesday, September 18th, 2018, filed under Tour Reviews. You can follow comment on this post through the RSS 2.0 feed. You can skip to the end and leave a comment. Pinging is currently not allowed. Finally some credt for the guy! Thanks for the review, I expected no less. I have never seen Glenn give a bad performance since he came clean decades ago. I am sure it was a great show! Glenn does what he does and it is usually a very good performance. But, you can’t compare an arena or stadium concert to a club show of less than 1000 people. It is NOT the same. In an arena/stadium the buzz is different if you are on the floors, if it is seated or open, back of the lawns, in a seat where no one stands, if you like to sit and lay back or get up and bop around…..
Club shows are more intimate and have a raw energy feel to them despite who the artist may be. Some bands can’t play arena shows because the get lost in the sheer size of the venue…. @ 1 You mean Last Concert in Japan I guess. Made in Japan is something totally different. Thanks so much .Good to hear how it went .Wish I could catch it myself . I could have written the same review for the Sept 7th show in Glenside, PA. Same setlist, great performance, and small but enthusiastic crowd. Great band around him playing songs i never thought i would hear live. His vocal power is amazing, and i love the fact i could purchase the recording of the show afterwards. Get out and see him if you havent. Hughes and Thrall did have some really good songs off their debut album……Coast to Coast is one of my all time favs…. but then they never toured off that album and then broke up, and then did the Black Sabbath album with Toni Iommi and then he got really mixed up on drugs and whiskey. Tommy passed away that year from the overdose of cocaine an quadludes as we all know. Tommy was a self taught musician with early styles of Stevie Ray Vaughen and Eddie Van Halen. he never really got the respect that they did, but he was Mexico. The best performances were those in South America. The Chilean drummer are a Paicey clone. Feel it on “You fool no one”. US tour are not so “similar” as original Purple songs, as GH would perform. I can’t imagine same tour with both Glenn & David togheter…!!! Was there in Poughkeepsie brilliant show, very good band. I was impressed by the drummer guy, what’s his name? hard rock Pete @11, The band playing with Glenn in Poughkeepsie were Jeff Kollman on guitar, Mike Mangan on keys, and Eduardo De Bernardes Baldo on drums. I have seen Glenn Hughes play 3 times over the past 5 years. The band he had for this particular tour was the tightest, most impressive one in my opinion.